Even I, the peerless pundit, the sagacious swami, the cunning connoisseur of baseball lore, sometimes have to give pause when any of these fine fellows' names is bandied about. It's easy to associate them with one another and don't say it doesn't happen to 2U! Gus Bell/Wally Post/Wally Moon...'50s '60's guys. Top-notch star-quality baseballers too. All famous for being on the Misakman All-NOUN team too. 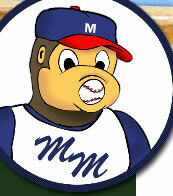 (See Misakman's All-Time Funny "Themed" Baseball Teams section). Jack Snow/Jim Kiick/Jim Otto/Ron Mix...We see that the NFL also had a decidedly Pro-MonoSyllabicism Movement bent back in the 70's. Jim Pagliaroni/Joe Pignatano/Don Pavletich...All 60's backup catchers no less! Sometimes I mix up Eddie Pellagrinini the 40's-50's infielder with them too. A.J. Burnett/Josh Beckett/John Burkett...They're all pitchers. All successful starters to boot! Michael Barrett/Gary Bennett...Both catchers and mostly Natl. League careers too. It's easy to foul them up with the pitchers just mentioned above too. What a mess. Darren Daulton/Darrin Fletcher/Damian Jackson/Damion Easley...The Baseball Gods are so cruel! They must be testing us. Orlando Cabrera/Miguel Cabrera/Melky Cabrera/Daniel Cabrera...There are even more guys out there with the same last name but these are the main guys. Jolbert is one of these guy's brother too! Mackey Sasser/Mickey Hatcher...I remember them both being kinda flaky baseball players too. Jose Cardenal/Chico Cardenas/Leo Cardenas...Trick one. Chico changed his name to Leo without informing me. His pre '70 Baseball Cards said Chico. I guess he felt 'Chico' was so... '60s. After all nobody wants to hang out with an Un-Chic-Chico. Pedro Ramos/Ruben Gomez/Phil Ortega...In addition to the obvious Latin name connection, they all would have similar losing seasons in the same era ('50s and/or'60s) and go on to sport those sub-.500 career W-L records. The first two were kinda infamous too. It's easy to forget who's who sometimes but Ramos was the one who gave up some mammoth moonshots to Mantle. Gomez was in famous scuffles for beaning/hitting guys. Ortega is familiar to baseball triviots for being in the same trade that also brought big Frank Howard from the Dodgers to the Senators. Rey Ordonez/Edgardo Alfonso/Alfonso Soriano...Excellent Latin-born infielders all. The names are only kinda similar. I think it's more because the 1st two guys were both on the same NY Mets teams. I know Rey was the SS and Ed the 3B but it's not instantaneous. I gotta break it down first. Luke Easter/Vic Power...50's 60's Big Hulking Sluggers. Vic played into the mid '60s. Luke was a real unsung hero, one of the forgotten pioneers breaking the A.L. color barrier. It was a bummer when he got shot by bank robbers in a holdup years later. Vic was a notorious hotdog around 1st base. A lotta fun. George Altman/Willie Kirkland...'60s unsung black sluggers sort of in the Fred McGriff/Cecil Cooper mold. Irrevocably linked in my mind since they both also had career years with almost 100 RBI seasons in the same year,1961. Altman had 96 for the Cubs and Kirkland 95 for the Indians after which they both quickly proceeded to fall off the map. Sorta like Mike Young/Franklin Stubbs/Sam Horn/Eric Anthony etc. in more modern times. They all fizzled out fast too after having a yr or two where they hit mucho homers.